I haven’t put in a lot of time on this game yet, so just a few comments on how it begins. Quest for Glory IV ended with the hero yanked away from the scene of victory by mysterious forces. Said forces turn out to be a wizard you met in the first game, who wants you to do some heroing over in Silmaria. It’s pretty well established by this time that every major region in this fantasy world is based on some piece of real geography and/or folklore. Silmaria is loosely based on ancient Greece and its mythology. I’ve been spending most of my time so far just talking to NPCs in the main city, picking up plot threads and quests for later reference. It seems like the majority of the inhabitants of Silmaria are characters from the previous games, who seem to have just somehow coincidentally converged on this one spot from all around the globe while the hero was wandering. It’s the Mediterranean weather, no doubt. Even the owner of the bank turns out to have been a beggar from QfG1. Also, a substantial fraction of the NPCs are furries of one kind or another. Playing this game years after the first four probably diminishes the impact of re-meeting these half-forgotten characters. And really, that was the case on its initial release, too, given how much it was delayed. But I suppose it’s all supposed to bring things full circle and summarize the entire five-game arc. It also lets you see how much the hero improved everyone’s lives. Some of them even help you in return. One of the first assignments you get in the game is to provide 1000 drachmas as an entry fee into the Rites of Rulership, the contest that will determine the next king of Silmaria. Well, a couple of NPCs from previous games front you half of that just for showing up. This sort of thing is usually unheard of in RPGs, but then, this isn’t exactly an RPG. Anyway, talking to everyone about every possible conversation topic sometimes yields Experience Points. The thing is, I don’t know what Experience Points are for. They can’t be for gaining levels, as there are are no experience levels; as with the rest of the series, each individual skill and attribute is improved independently through practice. The manual seems to indicate that experience points in this game are just a measure of how much improvement you’ve made, but if so, how did I manage to get 160 XP while only raising one stat by one point? The game also has an adventure-game score, called “puzzle points”. The manual states that there’s a maximum of 1000 puzzle points in the game, but it doesn’t mention a limit for XP. I think I’ll be paying more attention to the score that’s completable. Genre: Adventure, with RPG a close second. Release date: 1986-2002, due to a tie. Middling obscurity. Adventures skew obscure, so this essentially means the least obscure titles I have left. No strong expectations as to quality. Dragon Fire seems like it fits the bill pretty well. It’s the final episode of a prominent series of adventure/RPG hybrids from Sierra. It’s also one of the final generation of Sierra games, when they tried to stave off the reaper with experiments in 3D. Unlike their 2D games (ironically designated “3D animated adventures”), Sierra’s 3D adventures all seem to have had different engines and user interfaces: King’s Quest 8 was kind of Tomb Raider-like. Gabriel Knight 3 seems to be a first-person clue-hunting game reminiscent of the Tex Murphy games. Quest for Glory V is actually pretty close to the traditional 2D games; it uses 3D models for the characters, but it’s otherwise basically a point-and-click adventure game. The Quest for Glory series was originally planned as a four-part story, with a system of correspondences to the elements and the cardinal directions and so forth, although the authors broke this by inserting an unplanned episode after the second. After episode 4, the series was cancelled, leaving the story without its planned ending. I was disappointed at this development at the time, but I got over it. So over it, in fact, that when they decided, years later, to do the fifth game after all, I didn’t have the same enthusiasm for the series. I bought it in due course, and tried it out just enough to be put off by the voice acting and the need to learn a new and non-obvious UI, and now here it is almost ten years later. This kind of thing is the reason I have the Stack in the first place. There were some installation problems: the Quicktime 3 cutscenes didn’t work until I installed a fan-made patch. Thank goodness for fans who care enough to make patches! Even then, I had some problems with the sound popping, as if the software was breaking the audio data into pieces and then starting each piece a fraction of a second too soon. A forum suggested adjusting my sound card’s acceleration, and that worked. I’ll have to remember that solution; I have other old games that have the same problem. 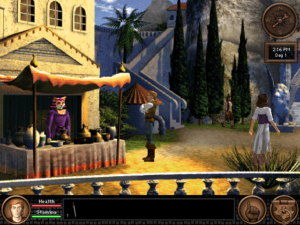 The graphics have the rough look of early 3D, the days of 640×480 software mode with no antialiasing. Distant objects are noticably distorted by the size of their pixels, but I’ll get used to it. More on plot and gameplay tomorrow. OK, enough smart-aleckry. I really did want to try Portal (Activision, 1986), and I could easily make another post or two about its content, but let’s talk about Portal (Valve, 2007). It’s a real gamer’s game, impossible to do in any other medium. I’m going to skip over the basics here, because they seem to have become an unavoidable part of geek culture just now. Something Awful and xkcd have riffed on the game, and “The cake is a lie” has become almost as oft-quoted a catchphrase as the intro to Zero Wing was a few years back. And there’s a big lesson right there. Six months ago, if you asked anyone who paid any attention to the game industry what the defining game of the year was going to be, there’s a good chance that they would have said Halo 3. It had the big marketing push, the tie-in products, the article in Wired about their innovative development process. Microsoft positioned it as the Xbox 360’s killer app, and tried to make its launch into as major an event as the release of the final Harry Potter book. And they sold a squillion copies, because obviously everyone with an Xbox 360 had to have it, if only because nothing else of note was being released for the Xbox 360. But once they bought it, it just seemed to sink out of sight. No one talked about it — what was there to talk about? No, the game that people are actually still talking about is one created as an extra for an anthology package. I suppose that the folks at Valve felt that this was a relatively safe place to experiment, as there was essentially no money riding on Portal‘s success. In that regard it resembles an indie title, but thanks to its tie to Half-Life, it got a lot of polish and a wide release. The best of both worlds. One of the most obvious ways this affected the game is that the developers didn’t feel it necessary to pad it out to the length that people expect of a major release. There isn’t a lot of repetition in the puzzles, and when an element is repeated, it’s generally to expose a new twist on the idea. This is generally a good thing, but I did feel that the puzzle elements had some unexplored potential. For example, the game never really takes advantage of the portals’ ability to reorient the player, apart from turning vertical momentum into horizontal momentum. But maybe there are some fan-made levels by now that do this sort of thing. That seems to be what fan levels are for: exploiting every detail. Since Portal‘s memes are in the air and hard to avoid, I knew a fair amount about what to expect going in, including some things, such as the fate of the Weighted Companion Cube, that it would probably have been better not to know in advance. But there were still surprises. I’m going to get a little spoilery, so if you haven’t played the game yet, for goodness sake do so now. 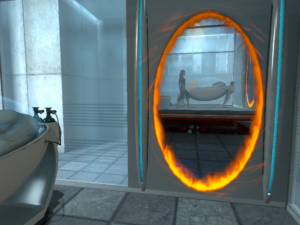 If you don’t want to spring for the entire Orange Box, you can get Portal individually via Steam for $20. This may seem like a lot for a game that takes about four hours to finish, but it’s a very high-quality four hours, and no more expensive than going to a cinema and watching two two-hour movies. And the movies wouldn’t even have bonus levels afterward. Somewhat perversely, I had played the fan-made 2D Flash version before playing the original game. As a result, I was somewhat taken aback by how much tutorial the original has (especially given its length), and the way that it doles out the portal-making capabilities piece by piece. The Flash version gets started a lot faster, and actually does better job, in some ways, of exploring the puzzle potential of the basic concept. But it has a very different nature: it’s just a straightforward series of puzzles, culminating in cake (no lie). Whereas Portal itself subverts exactly this structure beautifully. You have a set sequence of 19 puzzle-based levels to complete, as you’re reminded by the helpful signs at the beginning of each test area, and the last of those 19 levels is exactly what we’ve come to expect of final levels in puzzle-based games: it’s a kind of a final exam of all the techniques you’ve learned over the course of the game. The thing is, the game is only about half over at that point. Afterward, the narrative goes off the rails. Just the narrative, mind you. The gameplay is just as linear and level-based as ever. But for me, at least, escaping into the guts of the complex provoked a stronger sense of panic than anything else in the game. At one point early in that section, I was convinced that GLaDOS had sent something to chase me, on the basis of a couple of triggered motions and some ambiguity about the source of the sound effects, and I hurried to get someplace that could only be reached by portals. I think I was wrong about that — nothing of the sort happened in the game before or afterward. But it was a plausible development: I had broken the rules, so GLaDOS could break them too. GLaDOS really steals the show, by the way. She reminds me a lot of SHODAN from the System Shock games, but less gothic and more childish. Somehow, the way she keeps repeating lies that have already been exposed, apparently unable to comprehend that you might not trust her, manages to keep being delightful. And her closing song, “Still Alive”, has managed to replace “Invisible Musical Friend” (the Skullmonkeys bonus room theme) as best videogame song of all time. I honestly don’t know if the game would have been able to find its way into everyone’s hearts without her setting the tone. It would still have the gameplay and the puzzles, of course, and Valve managed a similar sort of sardonic deadpan humor without her in Half-Life, but it’s not really the same. Not only have I triumphed over my xyloid adversary, I managed it on my first attempt and with no casualties. Honestly, X-Death (and his ghastly chimeric alternate form, Neo X-Death) isn’t the toughest boss in the game. There are several optional bosses as extra challenges for those who want them. The toughest of them all is Shinryu, a dragon found inside a chest near the end of the final dungeon. The first time I opened that box, Shinryu wiped out my entire party with a single tidal wave; the second time, I was prepared for that, but only lasted slightly longer. But after some more spectacular failures, I managed to defeat Shinryu by exploiting Mimes. The Mime job is the last one acquired in the game, and is itself optional. Like many things in the game, it’s not obvious at first glance why it’s worthwhile: its sole special ability is the Mime command, which just repeats the action of another player character in combat. So it quite specifically doesn’t let you do anything new. Its big advantage is that miming costs no mana, even when it duplicates spell effects. So, I made a party entirely out of Mimes. By combining Red Mage and Summoner abilities, one of them could summon Bahamut, the strongest summonable in the game, twice in one turn. This was a very expensive cast, but once it was cast once, everyone just passed it along, resulting in eight Bahamut summons in every magically-accelerated combat round. Even facing this much damage, Shinryu managed to wipe out half my party before dying. There may well have been more efficient ways to win that fight, but this was my way, and it worked. It also worked beautifully on X-Death, who barely managed to scratch me at all before deresolving. Let this be the epitaph of he who would dare control the terrible power of the Void: “Here Lies X-Death, Slaughtered by Mimes. He was a tree.” Not that there would be a grave to inscribe this on or anything. We can’t even put up a commemorative plaque at his place of death, as the fight took place in an extradimensional void. After victory comes the longest ending sequence since The Return of the King. First there’s the denouement: the the party is escorted out of the Void by the spirits of the Dawn Warriors (“Your work is not yet finished…”), and there are assorted scenes of the world restoring itself, the crystals reforming, the various towns and castles that X-Death cast into the Void during chapter 3 reappearing, and so forth. Then there’s an epilogue set a year later, wherein we learn what the player characters have been doing, and get sepia-toned replays of scenes from the game. Apparently any party members who died in the last battle and were left behind in the Void get resurrected at this point, just in time to ride chocobos around behind the triumphant credits. When the credits are over, the final stats of each player character are displayed one by one, with a scrolling list of all the job abilities they learned. And when that’s finished scrolling, there’s another montage, presumably added for the Playstation version: it consists of scenes from the game re-created as pre-rendered FMV, using 3D models of the characters that look nothing at all like they do in the actual game. In fact, they look a lot like the original concept art by Yoshitaka Amano, which also doesn’t look much like what’s in the game. There’s a phenomenon here that I don’t really understand. Amano, the chief character designer for the Final Fantasy series from its inception, does all these vaguely-Pre-Raphaelite-influenced ink-brush drawings of slender people with delicate facial features and elaborate costumes, and then someone has to try to squash that design into a pixellated super-deformed version that fits inside a single map tile. The first six installments of the series were like this, so it’s not as if he didn’t know what was going to happen. Anyway, I’m done with it all now, and I’m glad I played it, even though I’ll probably have the battle theme going through my head for weeks. It’s definitely one of the best games in the series (of those I’ve played), and it’s all due to the story not strangling the gameplay for once. Tomorrow, Portal! I suspect that it will not take quite as long. [23 January] Did I say “tomorrow”? Obviously I meant “next week”. I’ll be brief. No, I haven’t finished the game. I’ve reached X-Death’s hideout in the void, where, confronted, he transforms back into his original form: a tree. Yes, a tree. No, this wasn’t a surprise. This gets into the pre-backstory: long ago, someone sealed another evil sorcerer’s soul in this tree, and over the centuries it corrupted and transformed it into the baddie we know. I’ve mentioned how the Dawn Warriors seemed to be the previous generation’s iteration of the same quest the player characters are on, but it seems that variations on the cycle have been going on for a long time. I expect that the final cutscene will contain hints that the evil still isn’t gone for good, and that future generations will face their own version of the story, making the title ironic in a new way. Anyway, the reason I haven’t plunged ahead into the final battle (or, I suspect, final uninterrupted series of battles) is that it’s so tempting to just keep mastering jobs. It’s so easy now! New job levels come so fast in the end zone. In fact, I was so keen on getting job experience that I didn’t even notice that the encounters in this area don’t yield any normal experience points at all: if you enter with a party of level 50 characters, they’ll still be level 50 after they’ve mastered every job in the game. This strikes me as a clever compromise. In a well-balanced CRPG, it takes about as long to get through the story as it takes to get enough XP for the final battle. But there’s always some danger that the player will decide to spend more time on that treadmill, rendering the mid-game boring and the endgame too easy. Extra character experience comes at the price of a diminished player experience. My singleminded pursuit of job mastery could have easily led me down that road, but for this XP-free zone. Mastering all the jobs in the game mainly just makes your characters more versatile, not more powerful. Except that versatility yields power. Some job skills allow for extremely potent combos. Give the Ninja’s dual-wield capability to the Berserker, and you get a character who can hold a warhammer in each hand. I honestly thought I would reach the end of the game this weekend, but the last bits have been taking longer than I expected, largely due to a whole slew of trick bosses. Generally speaking, there’s an approach that makes each boss easy to beat, but it’s different for each boss. Maybe it’s vulnerable to a particular kind of elemental damage; maybe it’s invulnerable to spells and has to be taken down entirely through melee attacks, or vice versa; maybe it has an attack that can wipe out your entire party in one round if you’re not prepared with specific defensive magic. The number of possible gimmicks increases as your capabilities increase over the course of the game. The scariest boss I’ve encountered so far is definitely Atomos, the final guardian of that force field generator back in world 2. This is one of those monsters that’s so freakish it doesn’t even look like a monster. It looks like a gateway to the swirling void, its frame irregularly decorated with spikes and fins and things. Its modus operandi is to bombard you with the Comet spell more or less constantly until someone dies, at which point it starts slowly drawing the corpse toward itself. Things don’t usually move around during combat, so it took me a while to notice that this was happening, and to convince myself that I wasn’t imagining it. When I did, I freaked out. The natural reaction here is to immediately resurrect the fallen as they fall, lest they disappear into Atomos’ inky maw. It’s also exactly the wrong thing to do. As long as Atomos is drawing someone in, it isn’t attacking. If you just concentrate on doing damage to Atomos, you can kill it before your comrade disappears, or, if that doesn’t work, distract it by deliberately killing another party member before resurrecting the guy who’s about to disappear. Most of the summonables in this game are bosses first, and become summonable when you defeat them. In fact, this game is fairly explicit about the idea that things become summonable by dying. There are two dragons in the game who are friendly with the party, die plot-related deaths, and become summonables in the process; one of them sacrifices its life specifically for that reason. Even weirder, there’s a couple of bosses in this game who show up as summonables in later games. Atomos is one, although I haven’t yet played the games where you can summon it. The other is Gilgamesh, X-Death’s incompetent right-hand man, who runs away from the first few battles (making him the first boss in the series that you have to fight multiple times) and ultimately gets banished to the Void by X-Death. I first saw Gilgamesh in FF8, and was baffled: he just showed up out of the blue, replacing Odin as the guy who randomly appears and ends battles for you. But at least Odin looked like the Norse god; what did this guy in the ridiculous puffy red outfit have to do with the hero of Sumeria? I’m pleased to now know where he really came from. Now, the endgame is basically a very long dungeon with a boss fight approximately every other room, and sometimes multiple boss fights in the same room. Most of them aren’t too gimmicky, and can be finished with general-purpose equipment and job assignments, but still, any boss fight I’m not expecting has the potential for an instant TPK. This makes for nervous exploration. I find myself running back to the save points a lot. But that’s okay, because that just means more ordinary random encounters, and in this area, ordinary random encounters yield grossly disproportionate amounts of job experience. This is the last chance to master jobs for the final battle, so the designers help the player along a little. Final Fantasy V was released in 1992 in Japan, but didn’t get a North American release until 1999, when Final Fantasy VIII was already out. As such, Americans didn’t see it as a new release, or even as a nostalgia item. Its main audience may well have been completists like myself. Eventually the publishers would start pandering to completists even more, adding features to track what percentage of the treasures in the game you had collected and suchlike. (And really, without that 100% treasure-collection rate to aim for, very few of the treasure chests in the game are worth opening. Most of them yield things that you can buy from a shop with the proceeds from a single encounter.) Such things were included in the later remakes of the earlier games, but not in the version of FF5 that I’m playing. So there are really two contexts for this game: Japan in 1992 and the West in 1999. In 1999, the big RPG titles in America were Baldur’s Gate and first wave of MMO’s, like Everquest and Asheron’s Call. Diablo was a couple of years old, and its influence was still strong: the emphasis in the RPGs of the day was on realtime action, with no hard separation between exploration and combat modes. Also, support for multiplayer play over the Internet was rapidly becoming a mandatory bullet point, even in games really not suited for it. I haven’t played a lot of Japanese RPGs, but it seems to me that they were developing quite differently at that point. 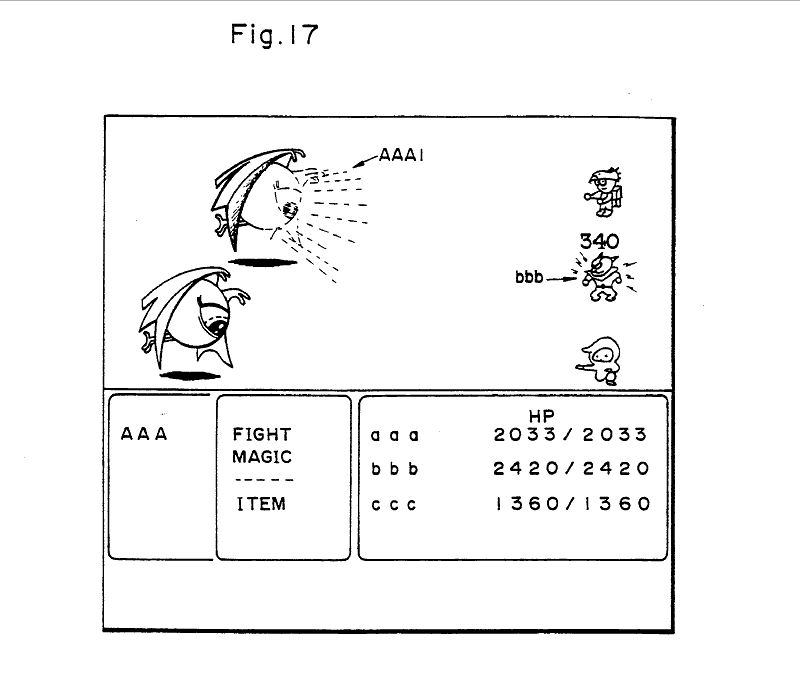 FF8 did a lot of experiments with gameplay (some of them unsuccessful), but still used essentially the same ATB system as FF5, modulo changing camera angles. Pokémon came out very close to this time, and has mechanics very similar to an early turn-based Final Fantasy. Pretty much the only thing separating FF5 from other Japanese RPGs circa 1999 was the SNESy graphics. So it seems like FF5, at the time of its American release and Japanese re-release, would have seemed more retro in America than in Japan. Indeed, the trends I speak of in Western RPGs were already starting at the time of FF5‘s original release in 1992, the year that saw Ultima VII put combat and exploration in a unified realtime environment (which Dungeon Master did five years earlier). But then, it kind of depends on how you define “RPG”. I noted before a bit in Metal Gear Solid 2 where the game refers to itself as “a kind of role-playing game”. I’ve seen the Zelda series classified as RPGs; if that counts, then they’ve been doing realtime integrated stuff since 1986, a year before Dungeon Master. I wouldn’t classify either of these things as an RPG — to me, the term basically means “imitates the mechanics of Dungeons & Dragons“, which is to say, stats and experience points and levels and so forth, and everything determined by die rolls modified by these figures. Notably, my notion of “RPG” has nothing at all to do with playing a role. And to the Japanese, who speak an entirely different language — well, who can say? The whole system is very strongly associated with Final Fantasy in my mind. Fight/Magic/Item is as emblematic of Final Fantasy combat as Name/Job/Bye is of Ultima conversations. And the only game I’ve ever seen that even tried to do something similar to ATB was Grandia 2, another Japanese console RPG, which places an ATB-like action timer (albeit with a different user interface) in a system with less abstraction and more running around the battlefield. Presumably the patent 1Be sure to click on the “more” link where that page displays the diagrams. They’re really the best part. prevents a direct imitation, but given the popularity of the Final Fantasy games, you might expect more outfits to try to create similar gameplay. But gameplay is not perceived as the Final Fantasy‘s strong point. Ask the fans what they like about the series, and they’ll talk about the stories, the characters, the worlds. It’s strange, then, that in FF5 I’m finding the gameplay (mastering the Jobs system) more engaging than the storyline (defeat the one-dimensional Bwa-ha-ha villain). 1. ↑ Be sure to click on the “more” link where that page displays the diagrams. They’re really the best part. Let’s try something here. Let’s play a little game. As I said before, I’ll probably wrap up Final Fantasy V soon. I want to do Portal afterwards, but that shouldn’t take long. As I hinted, I’d like to give the readers of this blog the opportunity to choose what I play after that. I still don’t want to post the contents of the Stack just yet, though. Instead, I’d like to know what kind of game commentary you want in general. I’ll try to pick the best fit from the Stack, and also bear the results in mind in future choices. First, let’s choose the genre. You can select more than one option in this one, and there’s a certain amount of overlap. I’ve listed them in order of how many there are on the Stack. Second, how old a game should I play? Finally, what kind of soul do you have? Should I play a game that I expect to be good or a game that I expect to be bad?